what better way to turn to in your darkest hour, or perhaps a portable generator with a light duty engine that might not want to start after it has been sitting with stale fuel, varnished or stuck carburetor, and a dead battery. A tractor is always on hand, is always maintained and used with a BAUMALIGHT PTO generator, it's ideal as an emergency power supply when utility power is unavailable. BAUMALIGHT has been making PTO Generators since 2000. We feel that we can offer farmers and property owners more for their money by using something they have on hand already. 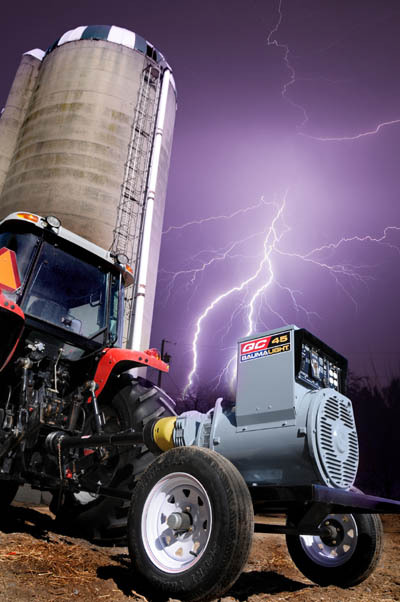 What you get with a PTO generator is more Kilowatts, less maintenance, and cleaner power. Electricity is no longer just a convenience, more and more we count on electricity for the necessities of life. On today's industrialized farms, reliable electric power is essential to its livelihood. During a mass black out rural properties are often the last to get power back sometimes days later than towns and urban areas. You need to have access to power that is ready to go at a moments notice. Back-Up and Remote power for your property. The TX series panel’s simple design provides easy straight forward operation to get you up and running in no time. 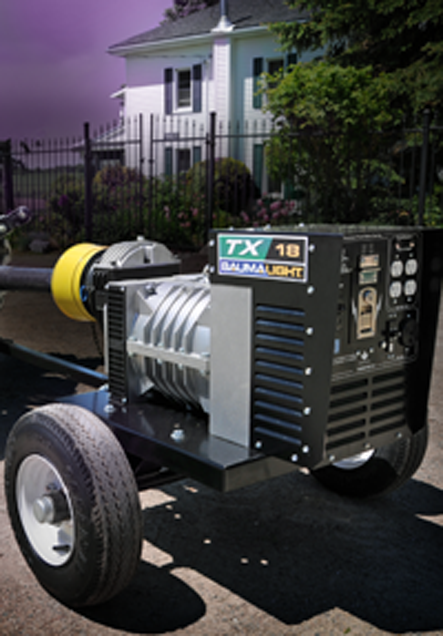 Mounted on rubber tires TX generators are easily handled for set up and storage. The tires also reduce vibration wear on the generators during use. Tried and true, DisplayMeter volt meters accompany every Baumalight TX generator to help get you in the zone quickly. All volt meters are conveniently positioned to be easily visible from the tractor. QC Generators keep your operation going. QC Generator connection panel come with Full Load connectors with a lockable cover and multiple receptacles with overload protection for safe simple operation. 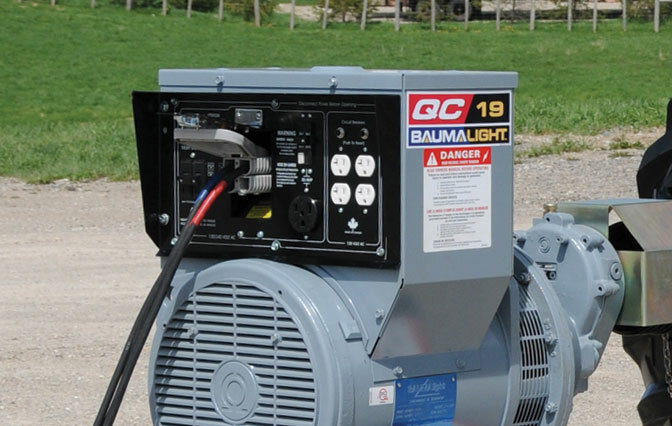 Designed to meet the needs of your operation the QC Generators are built for 24 Hr 7 day a week dependability. Designed exclusively for Baumalight QC generators, the DisplayMaster1 is your guide for quick, easy setup and an “at a glance” monitor of key performance factors.